Note: Before your first game, assemble the 4 small castles. 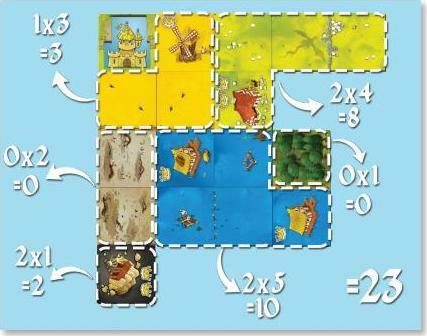 Connect your dominoes in order to build your kingdom in a 5x5 grid in a way to score the most prestige points. 2-player games: two kings of their color. 3- and 4-player games: one king of their color. 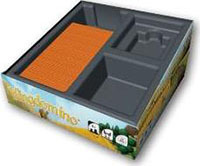 Each player takes a starting tile (a square) and the castle of their color. They place the tile, face up, in front of them and then they place the castle on it. 2 player games: first, remove 24 dominoes randomly, set them aside. Use the remaining 24. 3 player games: remove 12 dominoes randomly. Play with remaining 36. 4 player games: use all 48 dominoes. A Then, from the draw pile, take the same number of dominoes as the number of kings in play (i.e. three dominoes for a 3-player game and four dominoes for a 2- or 4-player game). Display them next to the box, numbered side up. These dominoes must be displayed in the ascending order (the lowest number next is always placed next to the box). Finally, turn them on the lands- cape side. C When all the dominoes have been chosen, form a new line, as you previously did, by drawing new tiles. The playing order is determined by the positions of the kings on the dominoes line. D 1 : Add the chosen domino to their territory according the connection rules. D 2: Choose a new domino in the new line by placing their king on it. 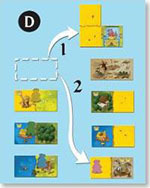 Then, it is the turn of the player whose king is on the second domino to take their two actions, and so on, until the last player has taken their two actions. In a 2-player game, each player will take the D 1 and D 2 actions twice, once for each of their kings. Then, form a new dominoes line and a new turn can start. The game is played in 12 turns in 3- or 4-player games, and only 6 turns in 2-player games (as each player plays twice each turn). The players must build a kingdom in a 5x5 grid (each domino is composed of two squares). Or connect it to another domino matching at least 1 of its landscape (horizontally or vertically only). 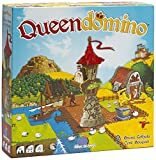 If you can't add a domino to your kingdom fol- lowing these rules, the domino must be discarded and you will not get points for it. All your dominoes must fit in 5x5 grid. If, due to bad planning, one or more of your dominoes could not fit, they are discarded. You will not get points for them. When the last dominoes are lined up, the players will take a last turn but they will only take the D 1 action. 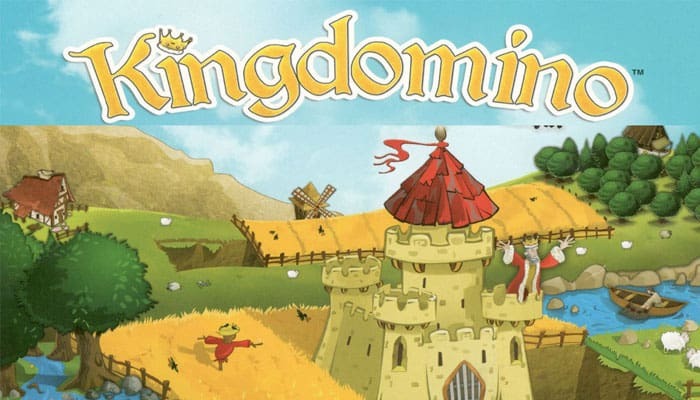 A kingdom is composed of different properties (groups of connected, either horizontally or vertically, squares of the same type of landscape). Each property will give you as much prestige points as the NUMBER OF SQUARES multiplied with the number OF specific crowns appearing on the property. You can have multiple properties with the same type of landscape in the same kingdom. ZA property without a specific crowns will give you no points. Each player will add the points given by all their properties, the result is their final score. The player with the highest score is the winner. In case of a tie, the player with the most extended property (whether he owns any crowns or not) wins the game. If it is still a tie, the player who has the most crowns wins the game. If there is still a tie anyway, the players share the victory. Dynasty: Play 3 rounds in a row. At the end of the 3 rounds, the player with the highest number of points wins the game. 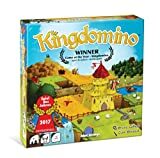 The middle Kingdom: score 10 additional points if your castle is in the center of your kingdom. 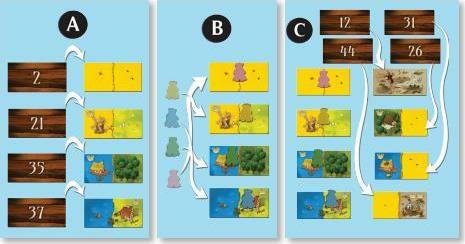 Harmony : score 5 additional points if you territory is complete (no discarded dominoes). The Mighty Duel: With 2 players. After one or two practice games, the real champions battle to build the largest kingdoms: use all the dominoes to build a 7x7 grid (a pen and paper might be useful to keep your final score). You can mix these different variants if you want according to what you prefer.